This full day program provided 6 kids, ages 5-7, an introduction to sculpture with wood. Over the course of 6 weeks they learned basic woodworking skills through life-size projects including making tool boxes, designing furniture, and building a play house. This program was co-taught with Anna Church. As an introductory project kids made tool boxes out of pre-cut pieces. After a demonstration about tool safety the group assembled their projects using hammers, nails, wood glue, drills and a 3/4" spade bit. In the second week, kids designed and built furniture out of 2x4's and plywood. They started by making sketches and taking measurements. Once they had the dimensions planned they used a jig saw, drills, screws, and clamps to construct their project. Gere and Lucy worked together to make benches. John made a chair based on the dimensions of a recycled cushion. The group pulled their works in progress together for lunchtime. The second week of furniture making consisted of Gene and Lucy painting and upholstering their benches, while John added a back and armrests onto his chair, and Donovan worked on a ramp for his shelf. With the building skills of the group steadily growing, the time was ripe to begin the final project which would take the final three weeks to complete - building a play house. We began by visualizing and sketching features of the play house. After everyone shared and listened to the variety of ideas, (which included a 2nd floor, skylight, balcony, and toilet), we started prioritizing and scaling the structure based on the materials available. Half of the group set-out to measure and build a 5'x5' deck out of 2x4's and plywood, while the rest began clearing an area in the woods for the play house to live. Their enthusiam drove them to completing the deck and framing a couple of walls. 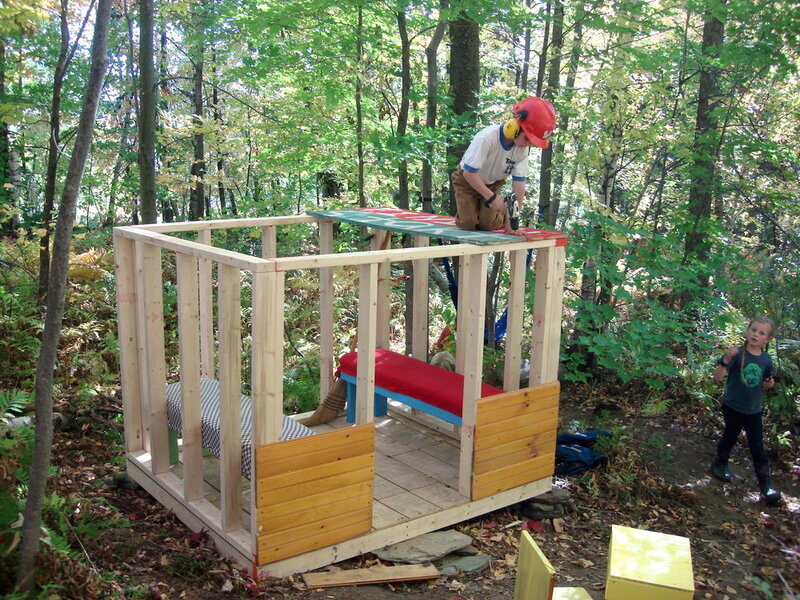 In the second week of the play house build the kids continued making wall frames. The third and fourth walls were assembled and attached before lunch. The afternoon comprised of sawing and attaching the wall panels and constructing the 2nd floor. On the last day, kids worked with Anna to weave a parachute cord hammock for the 2nd floor of the play house. Brody and Gere painted the exterior, while the rest of the group put the finishing touches on the climbable play house built entirely out of scrap wood.